What’s happening at Charlton House? And how would we know? 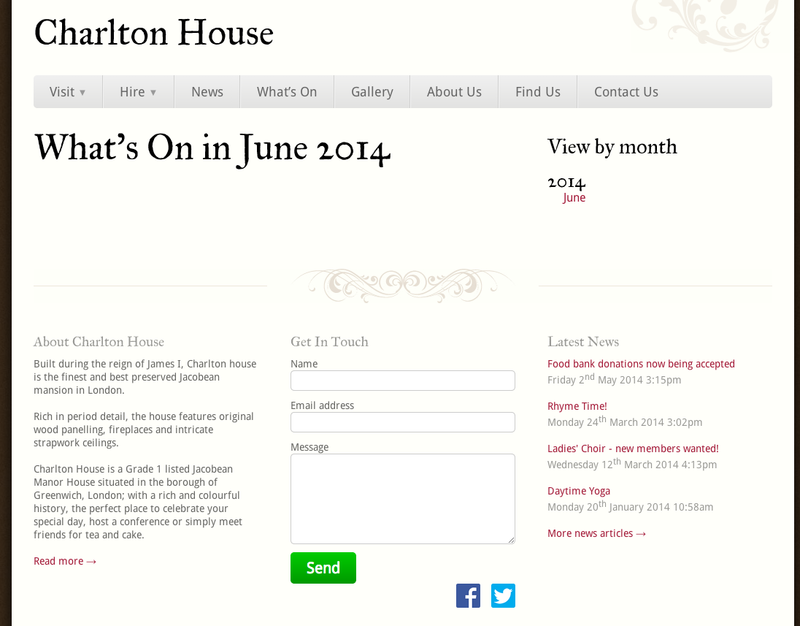 A recent flurry of comments on an old post reminded us to take a look at what’s happening at Charlton House. The answer – if the website and Greenwich Time are to be believed – is ‘almost nothing’. (There is mention of Friday lunchtime concerts and baby rhyme time elsewhere on the site, though). The Facebook pages and Twitter feed are updated sporadically – but with little interaction with followers – and events are included in Greenwich Time’s listing section occasionally (nothing this week, though); the council’s website is similarly low on information (the events page’s drop-down ‘what’s on where’ menu doesn’t include Charlton House as a venue). So how, without calling in, does a local resident find out what’s going on at Charlton House? In contrast to this, a short walk over the border into SE3, Mycenae House have been doing a great job of raising the profile of their events: a smartly-designed leaflet through locals’ doors (including into Charlton), a revamped website (compare and contrast with Charlton House’s website, which focuses heavily on pictures of empty blue chairs…), a refurbished bar/cafe, and a range of music and comedy nights that are pulling the punters in. It’s arguable that Charlton House’s Listed status places limitations on how it can be used, but this doesn’t seem to have presented a problem down the road in Bexley: Hall Place offers an excellent case study in what can be done to bring a property of this sort to life (and their social media efforts show how event marketing and audience engagement can be done successfully at this level). Of course, the internet isn’t everything, and we know that Charlton House does get used. But if the comments we’ve seen here and on our Facebook page are anything to go by, there’s a demand for Charlton House to be more than a few dusty meeting rooms and a nice wedding venue. We know that plans to spin it off into its own heritage trust were stymied, and are waiting to hear more about the plans for a borough-wide heritage trust to emerge. In the meantime, who’s speaking up for Charlton House? Can it get more than the bare minimum of attention from the council’s events and marketing team? One possible sign of optimism is that Charlton ward’s newly-elected councillor Miranda Williams has been appointed member for cultural and creative industries in the council’s new cabinet; hopefully she’ll be able to remind her colleagues that there’s more to the cultural life of the borough than what happens in Greenwich town centre or Woolwich’s General Gordon Square (or onboard Tall Ships, for that matter). We’d love to hear our councillors’ vision for the venue, and we’d love to hear what other users and readers think of the current offering – and what they’d like to see. Get in touch, or let us know in the comments below! Previous Article Hustings round-up – and how was it for you? Next Article Are you going to the Horn Fayre? Or the Horn Fair? Or both? It’s also the home of the International Institute of Education which runs many courses in teaching TEFAL for Japanrse students. They also run classes in Japanese for local residents which are a real bargain. Many of the students stay with local families for the duration of their course which a lovely way of building international links. Such a pity it’s not pubicised more. 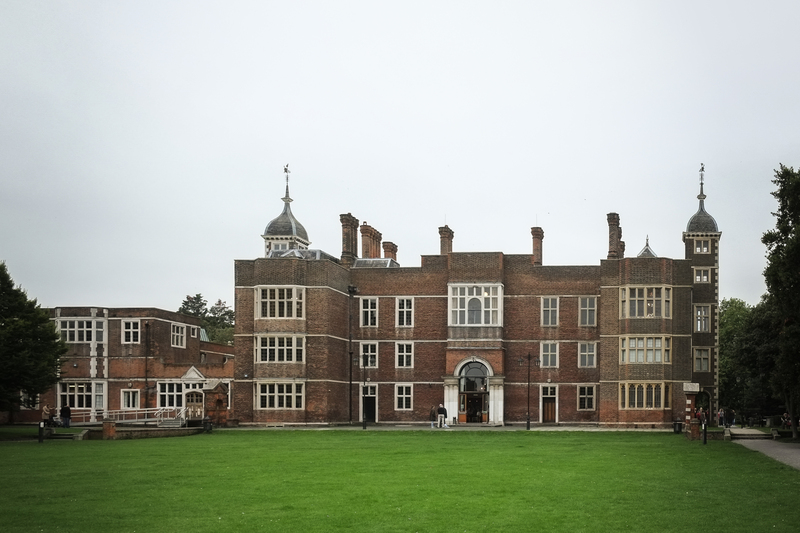 It would be great to see more noise made about all the activities at Charlton House. There is also a Friends of Charlton House group but they are almost invisible. I asked them last year if they would like me to put out details of their AGM on “the twitter” but they didn’t want the publicity – seemingly in case someone actually turned up to it. Most events I have seen organised (like the 1pm concerts) are daytime on weekdays. For events to reach all members os the community they need to be in the evening too. It would just be nice to have a place to hang out that offers drink,food and culural and leissure activities for everyody to enjoy. There is currently an exhibition of wildlife photography by Sue Green but,as you say, there is no publicity whatsoever. This week’s Greenwich Time lists four concerts and the Horn Fayre as ‘what’s on’ at Charlton House in July. Is that really it?